Currently, Georgia ranks #1 in the country for the number of persons under supervision by the criminal justice system. Most of the individuals incarcerated are poor and/or people of color. Of those, 54% of men in jail/prison are head of household, and 52% of incarcerated women are head of household. 1 in 28 American children have a parent in prison or jail. That is 2.7 million children. Not surprisingly, the communities from which these individuals come suffer tremendously. Hosted in partnership with Spelman College in conjunction with Public Square, in collaboration with Atlanta partners Gideon’s Promise, Common Good Atlanta, Women on the Rise and The Baton Foundation. Arizona’s Eloy Detention Center is the third largest immigrant detention facility in the nation. This special storytelling event will allows us to amplify the voices of activists, youth and LGTBQ+ people impacted by immigrant detention in Arizona and beyond. Hosted in partnership with States of Incarceration and ASU’s School of Historical, Philosophical, and Religious Studies. One out of every three South Carolinians has a criminal record. Nationally, people with records face 48,000 laws and statutes, often called collateral consequences, that restrict and diminish their lives and redemptive potential. The penalties that follow a conviction—including voter disenfranchisement and the loss of housing, healthcare, education, and employment—are deliberate choices that policymakers and legislators have made for years, and they function to marginalize and disenfranchise entire communities. Kentucky has the second highest rate of children with an incarcerated parent in the nation and it's time we address and remedy this issue. Since before the founding of the juvenile court in 1899, the US has struggled over whether to treat juveniles that commit crimes like children that need to be reformed, or adults who need to be punished. Studies, stories, and statistics show that youth prisons have failed to help young people get back on track. How can we expect young people to thrive in adulthood when they’ve spent their formative years behind bars? Hosted in partnership with WNYC Radio. The Milwaukee Secure Detention Facility (MSDF) is a temporary holding facility for people who have had their parole or probation revoked. Thousands of people have been re-incarcerated there without being convicted of a crime. The inhumane conditions at MSDF have led to the deaths of at least 19 people. Join the campaign to close MSDF. Sponsored by EXPO (Ex-prisoners organizing) and the #CLOSEmsdf campaign. The criminal justice system and the immigration detention systems work together to create a massive crimmigration network that includes jails, prisons, and detention facilities. How do these systems work together? How might formerly incarcerated and undocumented people stand in solidarity to end mass criminalization of Black and Brown communities? How do we support people who are coming home with serious mental illness and/or addiction? Too often people who need medical care are arrested and placed in jails and prisons where their medical needs go unmet. Does incarcerating people with addiction or mental illness make us safer or expand a growing public health crisis? A staggering 2. 7 Million children have a parent in prison. The deep consequences of incarceration on our communities begin with the family, often having long-lasting effects on our children. The costs of a parent’s incarceration are emotional as much as they are economic, and can no longer be ignored. It’s time that we listen to their stories. What are the challenges of your re-entry? What is the role of families in successful re-entry? What is the role of community organizations? What are the unique needs of people coping with mental illness or substance addiction when they come home from prison? 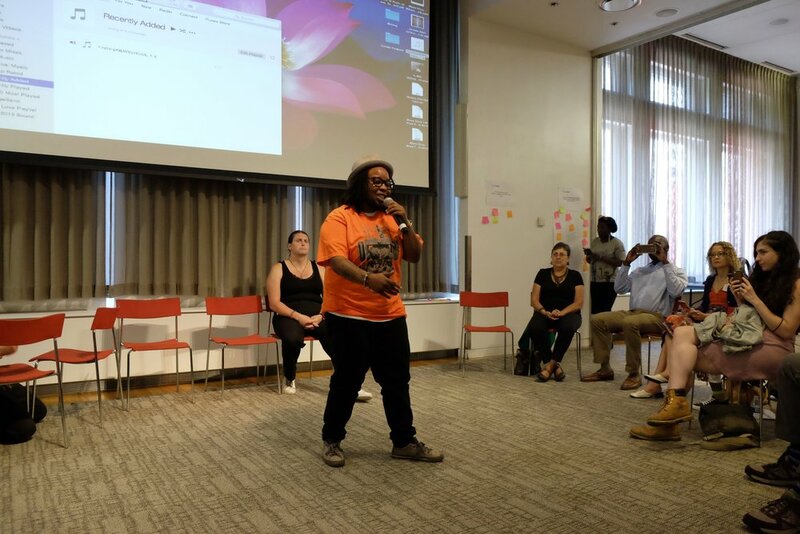 Community based organizations come together with family members and clergy to map the resources available and share stories about the intersectional challenges of re-entry and recovery. The Krome Processing Center opened in 1980 to house the more than 100,000 migrants who arrived in the U.S from Haiti and Cuba. In this Mass Story Lab, we hear the stories of people detained Krome over the last 35 years and others impacted by incarceration in Florida. How does the experience of detention impact a sense of community and belonging in Miami? In the era of Trump, what can we all do to protect those seeking sanctuary in the U.S? Hosted in conjunction with, "States of Incarceration: A National Dialogue on Local Histories". Sponsored by University of Miami Office of Civic and Community Engagement and Humanities Action Lab. How do we close Rikers Island and build stronger communities? Hosted in partnership with JustleadershipUSA and Humanities Action Lab. What are the intersections of mass incarceration and mass detention? Our Austin lab was a multi-lingual sharing of stories of people who have experienced Texas Incarceration Maze. What are the challenges and barriers to a successful reentry after prison? In every state, formerly incarcerated people are legally discriminated against in housing, employment, education, and more. Students from UNCG brought Mass Story Lab to the International Civil Rights Center and Museum to promote empathy, healing, reform, and justice. reporting back on their work.